The Find Nonzero Elements block locates all nonzero elements of the input signal and returns the linear indices of those elements. If the input is a multidimensional signal, the Find Nonzero Elements block can also return the subscripts of the nonzero input elements. In both cases, you can show an output port with the nonzero input values. The Find Nonzero Elements block outputs a variable-size signal. 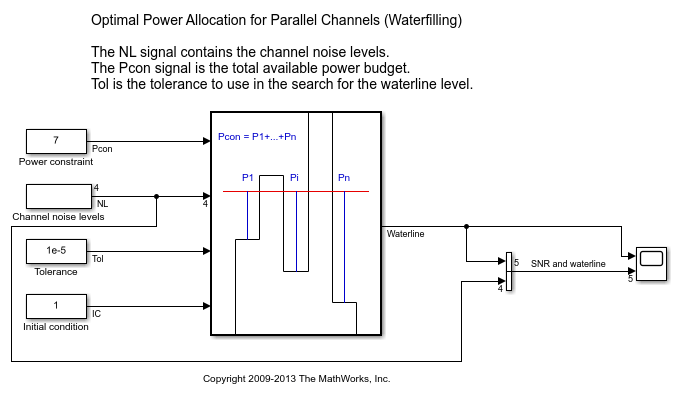 The sample time for any variable-size signal must be discrete. If your model does not already use a fixed-step solver, you may need to select a fixed-step solver in the Configuration Parameters dialog. For more information, see Solvers and Choose a Solver. Input signal from which the block finds all nonzero elements. The Find Nonzero Elements block outputs the indices of nonzero elements as a variable-size signal. You control the data type of the output using the Output data type block parameter. By default, the block outputs linear indices from the first output port. When you change the Index output format to Subscripts, the block instead provides the element indices of a two-dimension or larger signal in a subscript form. In this mode, you must specify the Number of input dimensions, and the block creates a separate output port for each dimension. The Find block can optionally output the values of all nonzero elements as a variable-size signal. To enable this port, select Show output port for nonzero input values. Select the output format for the indices of the nonzero input values. Selecting Linear indices provides the element indices of any dimension signal in a vector form. For one dimension (vector) signals, indices correspond to the position of nonzero values within the vector. For signals with more than one dimension, the conversion of subscripts to indices is along the first dimension. You do not need to know the signal dimension of the input signal. Selecting Subscripts provides the element indices of a two-dimension or larger signal in a subscript form. Because the block shows an output port for each dimension, this option requires you to specify the Number of input dimensions. Specify the number of dimensions for the input signal as a positive integer value from 1 to 32. To enable this parameter, set Index output format to Subscripts. Specify the indexing mode as Zero-based or One-based. For Zero-based indexing, an index of 0 specifies the first element of the input vector. An index of 1 specifies the second element, and so on. 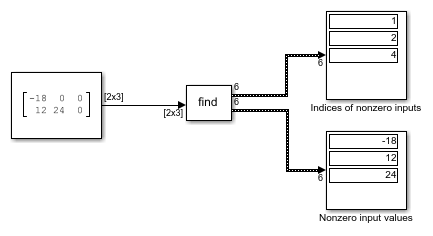 For One-based indexing, an index of 1 specifies the first element of the input vector. An index of 2, specifies the second element, and so on. Show or hide the output port for nonzero input values. When you clear this check box (off), the block hides the output port for nonzero input values. When you select this check box (on), the block displays the output port for nonzero input values. The additional output port provides values of the nonzero input elements. Specify the output data type. Use the Find block to find nonzero elements in an array.